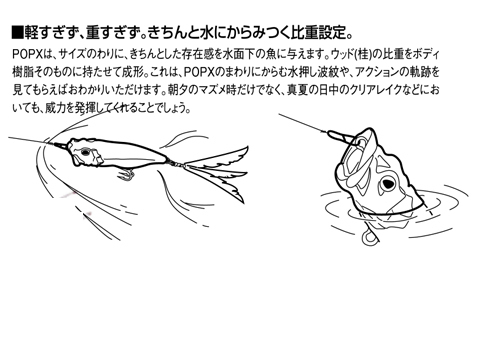 Introduced in 1996,POPX continues to dominate the high-end top-water bait markets of both Japan and the United States. 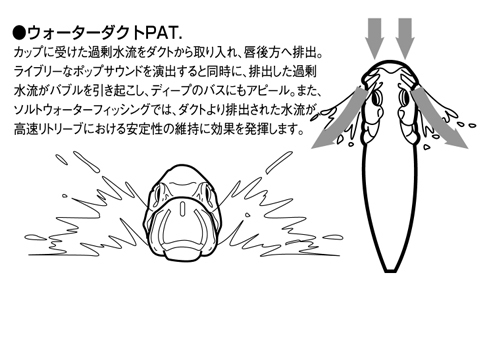 Equipped with MEGABASS original SIDE-STEPPING BALANCER(PAT),POPX walks a rolling dog-walk unlike any other poppers, and the WATER DUCTS(PAT)which imitate the bubbly water coming out of gills and help create a natural"bio-sound", not an ordinary popping sound. POPX also spits, not splashes, quite a distance. Currently 16 colors are available. "GG"stands for GUANIUM GHOST, the most shad-like finish, "PM"PEARL MICA(including SG CRACKED finish)and "GP"GUANIUM PHANTOM(including GP CRACKED finish),a see through phantom finish. HYDRO-CUP & WATER DUCT PAT. The POPX has a large impact and presence for its size, capturing the attention of fish below the surface. The body is constructed with a custom resin tuned to the same density as wood, for an exceedingly natural presentation. This is evident by examining its behavior in the water, namely its wake and its responsive movements. Not only for dawn and dusk, the POPX will perform excellently even under the midday sun.